It’s ironic that North Americans like to put their faith in complex medical treatments that they usually can’t even pronounce. A drug with a complicated name, concocted by people with PhDs in a laboratory at a well-known university, must surely be the best, most effective medicine, right? Sadly, for many people, drugs don’t live up to this idealistic expectation. Some drugs work for some people under specific circumstances. The rest of the time, it’s just a bunch of unwanted side effects that cause even bigger problems. Which is why, when a bit of scientific evidence comes along that a simple, non-drug remedy could help in the treatment of a major disorder, it’s worth listening to. Such is the case with yoga. Not everyone believes in the healing power of yoga—after all, it’s just a bunch of exercises that anyone can do. Where’s the scientific mystique and collective institutional brain power behind that? Well, just because it doesn’t have a fancy name doesn’t mean it’s not beneficial, because it is. In fact, one recent study found yoga could really help people with restless legs syndrome (RLS). PLUS: More on the health benefits of yoga. Researchers at the West Virginia University School of Public Health pegged RLS as a “common” disorder that causes a lot of sleep problems in people suffering from this condition. Medical professionals have been a bit stumped by RLS—no one medication seems to be able to treat the symptoms. 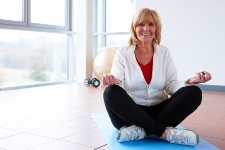 Many have turned to “relaxation therapies” like yoga to help their patients. For their study, the West Virginia research team looked at the effects of yoga on RLS symptoms in 13 women. All of these women were free of other conditions such as diabetes and sleep apnea. The yoga intervention involved eight weeks of gentle Iyengar yoga, which focuses on correct posture and breathing control while performing simple poses. After the eight weeks of treatment, the participants all demonstrated improvements in their RLS symptoms. Not only was the severity of their symptoms reduced, but they also eliminated some symptoms completely. The researchers called the results “striking.” The women in the study also reported having improved sleep, better mood, and reduced stress levels. There’s never been a better time to sign up for a yoga class—it could heal a whole host of health complaints, including relieving pain symptoms from debilitating conditions like RLS. Innes, K.E., et al., “Efficacy of an 8-Week Yoga Intervention on Symptoms of Restless Legs Syndrome (RLS): A Pilot Study,” J Altern Complement Med. December 27, 2012.